The people of Okitipupa, an oil rich Local Government Area in the south senatorial district of Ondo State, have lauded the wife of Ondo State Governor, Her Excellency, Chief Mrs Betty Anyanwu-Akeredolu, for her transformational leadership through the Forum for Wives of Ondo State Officials (FOWOSO) women empowerment program across the state. The commendation came during the grand finale of 14th edition of the three days exclusive empowerment program. Receiving the First Lady of Ondo State, who is also the founder of FOWOSO along side members in his palace, one of the traditional rulers in the area, His Royal Majesty, Oba Michael Obatuga Adetoye, the Jegun of Idepe – Okitipupa applauded Mrs Akeredolu for what he called extraordinary efforts in making women count in the society and reducing unemployment in the state by making women and youth economically viable against all odds. While commending the Akeredolu-led adminstration for providing conducive learning environment by building and renovating schools in the area, Oba Adetoye also called on Governor Akeredolu to come to their aid as a matter of urgency on the issue of gully erosion ravaging the area. In her goodwill message, the chairman of SUBEB and a daughter of the soil, Princess Oladumi Odu, said Mrs Akeredolu stands tall in her style of leadership and her grassroots-oriented programs which are making so much impact. Princess Odu encouraged the First Lady to keep on with the good work and called on the women in the area to continue to support her. The Chairperson of Okitipupa Local government area, Mrs Odewumi Oluyemisi, in her welcome address extolled Mrs Akeredolu empowerment program, describing it as transformational. Hon. 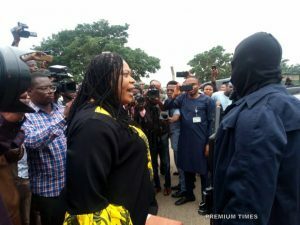 Morenike Alaka, the former chairman of Okitipupa Local Government Area, said in her vote of thanks that Mrs Akeredolu has been committed to living for others which according to her is demonstrated by transforming the lives of the less-privileged in the state and prayed God to continue to keep her. In her own remarks, the Sunshine State First lady said FOWOSO empowerment is targeted at making women economically relevant in their families and the society at large by making them productive through skills acquisition and called on the beneficiaries to live up to expectations. The women were trained in bead making, shoe making, wig making, soap making, among others. 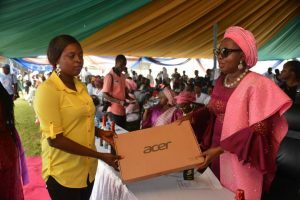 Some beneficiaries went home with laptops, sewing machines, grinding machines, and hair drying machines. Top government officials, politicians, women and youths in the area witnessed the event.